COPE NYC offers local, national, and international organizations opportunities to foster the intersection of ideas for creativity among diverse communities. The artists in residence exchange program supports this mission by fostering new relationships through creative endeavors and a cross cultural exchange of ideas among innovators. 2019, COPE NYC is launching its first artists in residence in Germany. This unique artists in residence provides lodging and studio space for artists, in a picturesque cottage, to create site specific work for an exhibit in a Berlin Gallery during the famous 26-28 Gallery Weekend April 2019 Berlin. This project emeriged through partnership with “Kunstleben Berlin” founder of New York Meets Berlin Project. Berlin - an international city known for its unique architecture, museums and creative community, with gallery owners, art lovers, and art enthusiasts. This is an innovative artists’ exchange between COPE NYC, Berlin, and Soulangh Cultural Village, Taiwan. The selected Taiwanese artist will create work for the Gallery Kunstwerkberlin during the annual festive Gallery Weekend Berlin. Berlin, a hub for creative minds and free spirits, has a thriving art scene. COPE NYC is pleased to announce its 2018 International Artists-in-Residence Program at the renowned Soulangh Artist Village. For this artists in residence we are partnering with Tainan Department of Cultural Affairs and Taiwanese American Arts Council. 13 Warehouses -- an integral space, suitable for contemporary art, visual art and performance art. Unique intersection of indoor and outdoor spaces waiting to inspire artists to create site specific installations. Contemporary living accommodations are provided within the Soulangh Artist Village. Your project space is within walking distance. The Project: Artist will create a site specific installation, inspired by the local surroundings and cultural heritage, which will become an exciting contemporary art learning experience for adults and children alike. Since its inception in 2013, Soulangh Artist Village has welcomed families to its recreational space. This is why the 2018 COPE NYC Open Call invites artists of all disciplines to think of proposals in which site specific installations merge with modernity, folk tradition, and inspiration for children. Artists will be given a month long time frame to create and install their site specific work. Location: Soulangh Park, the grounds are home to the former Japanese sugar factory, with railroad tracks, and cargo trains. The village is a thriving community of artists. This is a great opportunity to engage with local artists and visit the ongoing cultural events - from live performances to an array of exhibits, from the Children’s Museum to the Tainan Cultural Folk Art Museum - inspiration abounds. In the heart of the fertile Jianan Plains, between historic Siraya National Scenic Area and ecologically rich Taijiang National Park, Soulangh Cultural Park arose from the former Jiali Sugar Factory. Soulangh, surrounded by farms and quaint villages, is a half an hour bike ride to downtown Tainan with its night market, museum and Buddhist temples and minutes to hi-tech Tainan Science Park. It’s a short bike to cafes and restaurants. Park History: The Soulangh Sugar Factory, established in 1906, was the Meiji Sugar Corporation’s first modern sugar refinery. After the war, the Taiwan Provincial Office took control of all Japanese sugar corporations. In the 1970s the sugar plant witnessed a time of prosperity and was renamed the Jiali Sugar Factory. Sugar is still a valuable commodity. SAV utilizes fourteen historic sugar warehouses to create an arts and culture facility which is a home to permanent and special exhibitions. Materials: Artists can bring their own materials in addition to materials provided by Soulangh Artist Village. Hospitality: There is an independent house with living room, kitchen, laundry facilities and yard. Artists will be accommodated with their own bedroom with private restroom, and free wifi. Bicycles will be provided during the time of the residency for artists to ride through the scenic Soulangh Cultural Park to get to the convenient City Center Supermarket -- a fifteen minute ride. Alternatively, a bus ride to City Center is 30 to 40 minutes. The artist is responsible for living expenses which are very low. COPE NYC is pleased to announce the third year of its Artist in Residence Program at the Acumen Capital Partners LLC Building in Williamsburg, Brooklyn. Art, social advocacy, and sustainability, with the involvement of post-secondary schools and the community, align with the COPE NYC mission to bridge communities through an intersection of creative ideas. 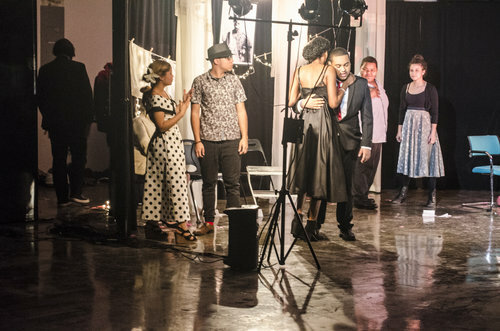 Sprawling open space provides opportunities for visual and performance artists, designers and architects to intersect through a dynamic exchange of ideas. Pratt Institute alumni and student creation of a visual backdrop for their theatrical interactive performance, "Fish Bones" for the community. Juan Morel Campos Secondary High School theater performance, "In the Time of the Butterflies", based on the Julia Alvarez novel of the same name. The Residency Project: This is an opportunity for civic engagement, social advocacy, art, and sustainability within local, national, and international communities. We encourage collaboration with a business in the Acumen building or neighborhood. The artist-in-residence is required to exhibit his/her finished work in mid-November at the Acumen Capital Partners LLC Building. Artists-in-residence are responsible for their materials. COPE NYC is not responsible for loss or damage of work. Location: Acumen Capital Partners LLC, situated at the crossroads of Williamsburg, home to Bedford Stuyvesant historic brownstones, is host to over 150 businesses which include: Artists, Designers, Media, Music, Entrepreneurs, Hi-Tech, Fashion, Film, Office, Distributors, Retail, Non-Profits, and Food and Wine Companies. Brooklyn subway is across the street from Acumen. Free Materials: COPE NYC is in partnership with Materials with the Arts, which is opening its doors to the artists in residence to make art from reusable materials. No purchase of materials is necessary. For artists who are not using materials from Materials for The Arts, and plan to bring their own materials, please put that in the proposal and what medium you will be using. All work is about creative reuse. Tools: The artists-in-residence must bring their own tools. All tools to be used must be listed so that the building and COPE NYC can be made aware in advance. Sign in sheet will be available. Space: The residency provides a free space, open to studio visits during specific times, 24/7 access (with exception of scheduled workshops in place). Proposal Guidelines: Once materials are picked up, submit a Group Project Proposal, Maximum 300 words and sketch of what you will create. The artist-in-residence must be dedicated to civic engagement. There will be opportunities to share their work with the museum professionals, gallerists, collegiate institutions with strong art departments, and art associations and the community. To share the dynamics of this project with the community a drop box for all participating parties that are involved will be created to post images and or video clips. It is important all contributing artists submit documentation to show the vitality of this project. New: Partnership with Empathy Academy. In addition to artists in residence submitting their group proposal they also have the opportunity to work together on Mare Nostrum (Our Sea). COPE NYC is excited to announce a new partnership with Empathy Academy whose project, Mare Nostrum (Our Sea) 2016, will be developed as part of the COPE NYC residency in partnership with Empathy Academy and continuing partners, Materials for the Arts, Pratt Institute, Brooklyn College, Adelphi University and others who will work together to build a 30-foot sculpture of a boat that was 3D scanned in Venice, Italy when Stephanie Owens led a workshop on global migration as part of W.A.V.e. International Festival hosted at University IUAV of Venice. The boat form will be made of up-cycled and found materials but fabricated using digitally controlled, CNC machines. Stephanie Owens is an artist, writer, and curator who is Founding Director of Empathy Academy: Platform for the Future of Art, Design + Matter. Stephanie brings an impressive track record to the residency that COPE NYC looks for in collaborators. She is a professor of digital media and recently Director of Cornell Council for the Arts at Cornell University where she created the university's first campus-wide biennial to bring contemporary art together with research science to develop large scale public art projects. Mare Nostrum (Our Sea) is a project that realizes for the first time a 1:1 scale sculpture made from the 3D scanned model of a cargo boat similar to those that carried refugees to the shores of Italy. Owens produced the realistic 3D model of the boat with students and local craftsmen using a photogrammetry process technique that captures the wear and scars of the boat from its use over time. Her workshop, "Object Empathies," asked students to imagine that they were forced to travel to an unfamiliar new land and could only take one object with them. Each brought to the studio one object that was also 3D captured and made into a 1:1 model. Cornell students were part of a similar project and eventually both the Venetian objects and the Ithaca objects were digitally "fused" to the boat model. The aggregate model (boat + objects) is meant to be a sculptural form that changes its shape at each new location to which it "travels"---where the model is downloaded as fabricated as a new iteration of the sculpture each time. COPE NYC is pleased to announce its 2017 International Artists-in-Residence Program at the renowned Soulangh Artist Village. For this artists in residence we are partnering with Tainan Department of Cultural Affairs and Taiwanese American Arts Council. The Project: Artists-in-Residence at Soulangh Artist Village. Artists are invited to create a site specific installation that is inspired by the surroundings and cultural heritage of the Taiwanese Community. 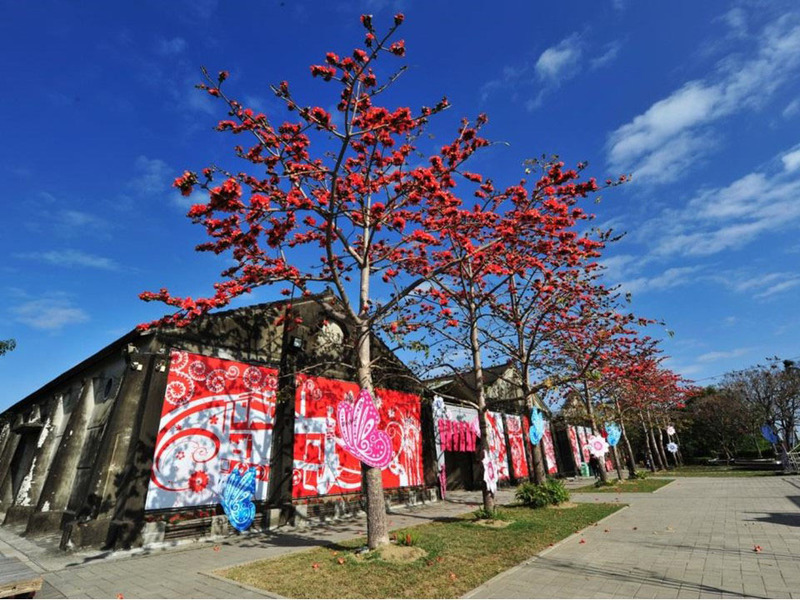 Location: Situated in the Soulangh Cultural Park, Taiwan, the village is a thriving community of artists. This is a great opportunity to engage with local artists and visit the ongoing cultural events - from live performances to an array of exhibits, from the Children’s Museum to the Tainan Cultural Folk Art Museum - inspiration abounds. In the heart of the fertile Jianan Plains, between historic Siraya National Scenic Area and ecologically rich Taijiang National Park, Soulangh Cultural Park arose from the former Jiali Sugar Factory. The revitalized Japanese era sugar refinery warehouses successfully merge historic architecture with modern design in an area rich in culture. The park is a stronghold for traditional performance and folk arts, and is emerging as a modern art venue. Park History: The Soulangh Sugar Factory, established in 1906, was the Meiji Sugar Corporation’s first modern sugar refinery. After the war, the Taiwan Provincial Office took control of all Japanese sugar corporations. In the 1970s the sugar plant witnessed a time of prosperity and was renamed the Jiali Sugar Factory. Hospitality: There is an independent house with living room and kitchen. Artists will be accommodated with their own bedroom, free wifi. Bicycles will be provided during the time of the residency for artists to ride through the scenic Soulangh Cultural Park to get to the convenient City Center Supermarket -- a ten minute ride. Alternatively, a bus ride to City Center is 30 to 40 minutes. The artist is responsible for living expenses which are very low. More information for Soulangh Cultural Park click here. COPE NYC is pleased to announce its second Artist-in-Residence Program at the Acumen Capital Partners LLC Building in Williamsburg, Brooklyn. The Project: In the Spirit of CREATIVE REUSE, artists will be turning reusable materials into artworks. Location: Acumen Capital Partners LLC is situated at the crossroads of Williamsburg - the epicenter of Brooklyn, home to Bedford Stuyvesant historic brownstones, and a hub for talent including the popular new music performance venue, National Sawdust. Acumen is host to over 150 businesses which include: Artists, Designers, Media, Music, Entrepreneurs, Hi-Tech, Fashion, Film, Education, Office, Distributors, Retail, Non-Profits, and Food Companies. Free Materials: COPE NYC is in partnership with Materials for the Arts, which is opening its doors to the artists in residence to make art from reusable materials. All work is about creative reuse; no purchase of materials is necessary. Guidelines: Once materials are picked up, submit a Group Project Proposal, Maximum 300 words and sketch of what you will create. The artist-in-residence must be dedicated to civic engagement. There will be opportunities to share their work with the museum professionals, gallerists, collegiate institutions with strong art departments, art associations, and the community. To share the dynamics of this project with the community a drop box for all participating parties that are involved will be created to post images and or video clips. It is important all contributing artists submit documentation to show the vitality of this project. *For artists who are not using materials from Materials for The Arts and plan to bring their own materials, please put that in the proposal along with the medium you will be using. The residency provides a free space, open to studio visits during specific times, 24/7 access, materials obtained from Materials for the Arts. The artist-in-residence must bring their own tools. All tools to be used must be listed so that the building and COPE NYC can be made aware in advance. Sign in sheet will be available. The artist-in-residence are required to exhibit their finished work in mid-November at the Acumen Capital Partners LLC Building. Artists-in-residence are responsible for their materials. A trendy Brooklyn neighborhood full of innovation. COPE NYC is pleased to announce its Artists-in-Residence Program at the former Pfizer Building in Williamsburg, Brooklyn, a building renowned as an incubator of innovators and a supporter of sustainable environmental practices. COPE NYC artists in residency offers an abundance of materials and space with floor to ceiling windows that allow sunlight to filter through the 13,000 square feet. The Pfizer Building is situated at the crossroads of Williamsburg – the epicenter of Brooklyn - home to historic brownstones and a hub for talent including popular music venues like National Sawdust. The sprawling Pfizer Building is host to over fifty businesses which include BFDA, Pratt MFA Studios, Film Makers, Artists, Designers, Media, Music, Entrepreneurs, Hi-Tech, Fashion, Distributors, Retail, Non-Profits, and Food Companies. Artists-in-residence can network, exchange ideas, and let creativity to take flight! Queens Museum renowned for its openness to diversity. In 2015 COPE NYC partnered with InSEA, USSEA and the Queens Museum to organize the three day international conference, An Inclusive World: Bridging Communities for professionals in the arts to share ideas. Queens Borough Deputy President Melva Miller opening speech echoed all who were in attendance,“All of us here today know that if there’s one thing that can cross racial, ethnic and geographic boundaries, it’s the arts,” said Miller. The Queens Museum's open contemporary space provided a unique opportunity for greater intercultural dialogues forging new partnerships. During the time of the conference, COPE NYC's travelling project An Inclusive World was exhibited with artists known for creating wonders through creative reuse. An Inclusive World contributing artist, Alice Hope had a unique opportunity to utilize Queens Museum space that faces the Unisphere, a worldly source of inspiration. Copyright © 2019 COPE NYC All rights reserved.